We have been trying to move to a new home over the last few months and for one reason or another, we just haven't been able to make this happen. Our close and move in date just kept getting pushed and this ended up interfering and postponing multiple trips. With Good Friday off, BeeGee and I just couldn’t handle this any more so we headed out Thursday evening. BeeGee and I take an awkward selfie at the Cedar Breaks Trailhead for Goodwater Loop. As we arrived at Cedar Breaks Park the sky was already twilight and the park was mostly empty. 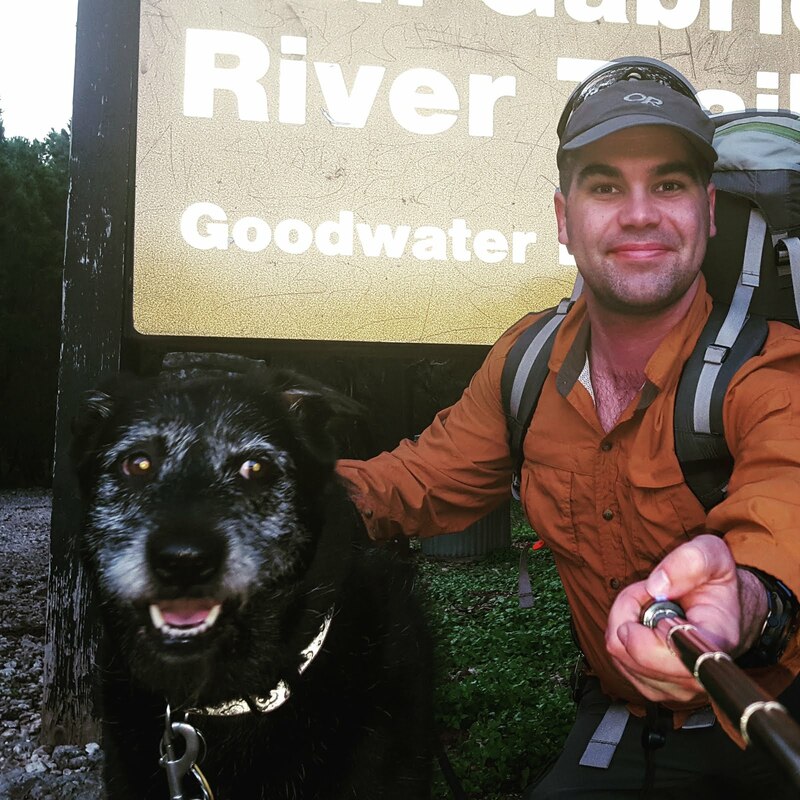 At the trailhead of Goodwater Loop, we find two fellow backpackers gearing up and they started a little before us. We took just enough time for a trailhead selfie and started on our way. We quickly caught up to the pair of backpackers and they seemed a little weirded out by us following them, so BeeGee and I took a short break and let them get some distance. Once we were back on the trail, the sun had set and it was very dark out without the moon in the sky yet. We hiked on and gained a new perspective of Goodwater Loop as we had never hiked this much of the trail in the dark. What felt like just a short jaunt, we were at the first creek crossing. Unlike the last time we were here, the water levels looked normal (high water trip). We took a second for BeeGee to splash around and then we were off again. As we neared Crockett Garden and Falls, a large creature came charging out of the darkness towards us. It was shocking at first, but instinct kicked in and quickly prepared myself for whatever may lie ahead. I quickly realized it was a cow and moved towards it while clapping and telling it to "get out of here". That mostly worked, but the longhorn had it out for BeeGee while keeping its gaze leveled at her and occasionally stepping towards her. We quickly left that area and made it to Crockett Gardens. This longhorn wanted to forcibly remove BeeGee from the area, but we were able to slide on by. By this time, it was more than dark enough for me to try out my new headlamp as we neared Cedar Hollow Camps. My Black Diamond Storm Headlamp and its red light was more than enough to navigate with, but I went dark when I heard voices in the woods. It turns out the backpackers BeeGee and I saw earlier were already set up and hanging out. As the time and miles flew by, BeeGee successfully evaded any critters and went un-skunked. We arrived Sawyer Hollow Camp around 23:00 (11 pm) and began setting up. The moon was large and bright, perfect for camp chores and lounging around and relaxing after a long walk. After an hour or so of enjoying the outdoors, lake, and moon we jumped inside the tent and went to sleep. Except BeeGee didn’t really sleep the entire night. I left the rain fly open because it was a little warm out and BeeGee spent the entire night just staring out. The few times I woke to check on her, she really seemed to be enjoying herself. The bright moon was rising above the lake. As seen from our campsite. Morning came and we broke camp, had a quick breakfast, and prepared for our 8-mile hike out. Before leaving, I noticed the building around the pit toilets collapsed on top of the pit toilets, so cat holes it is from now on. I was also a bad friend and forgot BeeGee’s leash hanging on the tree next to our tent. Thankfully, there weren’t many hikers out and when we found some I’d call BeeGee over and we would step off the trail to let others pass. A caterpillar was just hanging out on our tent the next morning. The walk out was enjoyable but uneventful and warm. We made it back to the car by noon and headed home. While being a night owl didn’t affect BeeGee on the hike, as soon as we were home she passed out. I was also sleepy and tired but felt so relaxed. This short trip was just what I needed. Make sure to leave a comment below telling me about your much-needed trip. Also, if you like the blog follow us on Facebook to keep up to date. It was amazing and I wished we stayed out longer.